La Rage (The Rage) by French female rap artist Keny Arkana, released in 2006. How Do Many South Koreans feel About the USA Free Trade Agreement? 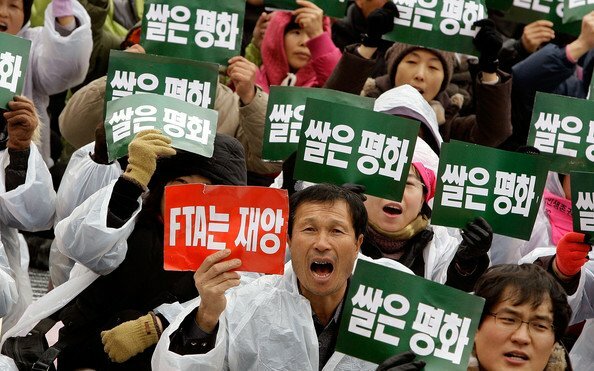 South Korean farmers take part in a rally to protest against the South Korean Free Trade agreement (FTA) with the USA at Seoul Railway Station on December 8, 2010 in Seoul, South Korea. President Barack Obama cited his pleasure at the resolution of outstanding issues over the deal last week, a deal expected to increase American goods exported to South Korea by up to USD11 billion. The 2007-signed FTA had been held up due to concerns over auto and beef industries, with Obama hoping the new pact will be a model for future FTAs. We are telling the guys there on Wall Street – Hey, look down! Justice, not just for the people of the US, but for everybody. 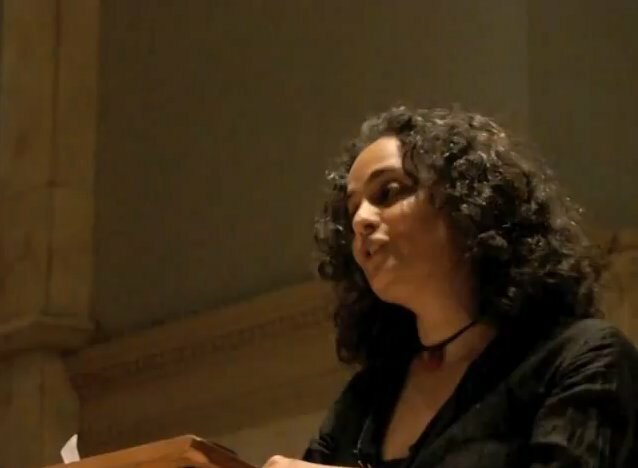 The text of the speech by Arundhati Roy at the People’s University in Washington Square, NYC on November 16th, 2011. Tuesday morning, the police cleared Zuccotti Park, but today the people are back. The police should know that this protest is not a battle for territory. We’re not fighting for the right to occupy a park here or there. We are fighting for justice. Justice, not just for the people of the US, but for everybody. What you have achieved since September 17th, when the Occupy movement began in the United States, is to introduce a new imagination, a new political language into the heart of empire. You have reintroduced the right to dream into a system that tried to turn everybody into zombies, mesmerized into equating mindless consumerism with happiness and fulfillment. As a writer, let me tell you, this is an immense achievement. And I cannot thank you enough. We were talking about justice. Today, as we speak, the army of the United States is waging a war of occupation in Iraq and Afghanistan. US drones are killing civilians in Pakistan and beyond. Tens of thousands of US troops and death squads are moving into Africa. If spending trillions of dollars of your money to administer occupations in Iraq and Afghanistan is not enough, a war against Iran is being talked up. Ever since the Great Depression, the manufacture of weapons and the export of war have been key ways in which the United States has stimulated its economy. Just recently, under President Obama, the US made a $60 billion arms deal with Saudi Arabia – moderate Muslims, right? It hopes to sell thousands of bunker busters to the UAE. It has sold $5 billion-worth of military aircraft to my country, India, which has more poor people than all the poorest countries of Africa put together. All these wars, from the bombing of Hiroshima and Nagasaki to Vietnam, Korea, Latin America, have claimed millions of lives — all of them fought to secure the “American way of life”. Today, we know that the “American way of life” — the model that the rest of the world is meant to aspire towards — has resulted in 400 people owning the wealth of half of the population of the United States. It has meant thousands of people being turned out of their homes and their jobs while the US government bailed out banks and corporations — American International Group (AIG) alone was given $182 billion. The Indian government worships US economic policy. As a result of 20 years of the free market economy, today, 100 of India’s richest people own assets worth one-quarter of the country’s GDP while more than 80% of the people live on less than 50 cents a day. Two hundred and fifty thousand farmers, driven into a spiral of debt death, have committed suicide. We call this progress, and now think of ourselves as a superpower. Like you, we are well-qualified. We have nuclear bombs and obscene inequality. The good news is that people have had enough and are not going to take it any more. The Occupy movement has joined thousands of other resistance movements all over the world in which the poorest of people are standing up and stopping the richest corporations in their tracks. Few of us dreamed that we would see you, the people of the United States on our side, trying to do this in the heart of Empire. I don’t know how to communicate the enormity of what this means. One, an end to cross-ownership in businesses. For example, weapons manufacturers cannot own TV stations; mining corporations cannot run newspapers; business houses cannot fund universities; drug companies cannot control public health funds. Two, natural resources and essential infrastructure — water supply, electricity, health, and education — cannot be privatized. Three, everybody must have the right to shelter, education and healthcare. Four, the children of the rich cannot inherit their parents’ wealth. This struggle has re-awakened our imagination. Somewhere along the way, capitalism reduced the idea of justice to mean just “human rights”, and the idea of dreaming of equality became blasphemous. We are not fighting to just tinker with reforming a system that needs to be replaced. As a cap-ist and a lid-ite, I salute your struggle. 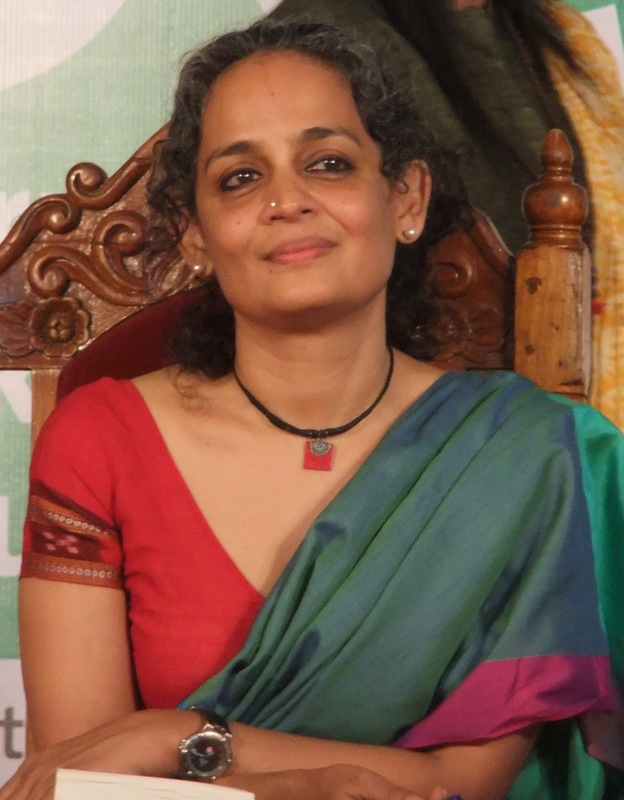 Arundhati Roy was born in 1959 in Shillong, India. She studied architecture in New Delhi, where she now lives, and has worked as a film designer, actor, and screenplay writer in India. Her latest book, Walking with the Comrades, recalls her time with indigenous Maoist rebels of the Indian forests. 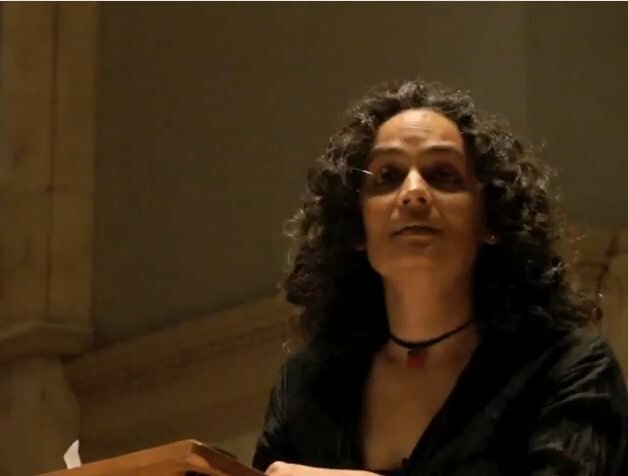 A tenth anniversary edition of her novel, The God of Small Things (Random House), for which she received the 1997 Booker Prize, was recently released. She is also the author of numerous nonfiction titles, including An Ordinary Person’s Guide to Empire. It is Rare that the Media Gets it Right. Here is One Instance. Hear Keith Olberman take Bloomberg to task on the evening after the sneak paramilitary dispersal of the Occupy Wall Street protestors from Liberty Park. He also calls for the resignation of Bloomberg and NYC police commissioner Raymond Kelley. Bloomberg Now, Bloomberg Tomorrow, Bloomberg Forever! In a Special Comment, Keith contextualizes Mayor Bloomberg’s actions against Occupy Wall Street at Zuccotti Park and how they have – unintentionally – vaulted the movement from a local nuisance to a global platform for the disenfranchised. Public Citizen board member Jim Hightower speaks at the organization’s 40 Anniversary Gala. For more information, visit: http://www.citizen.org/40gala.